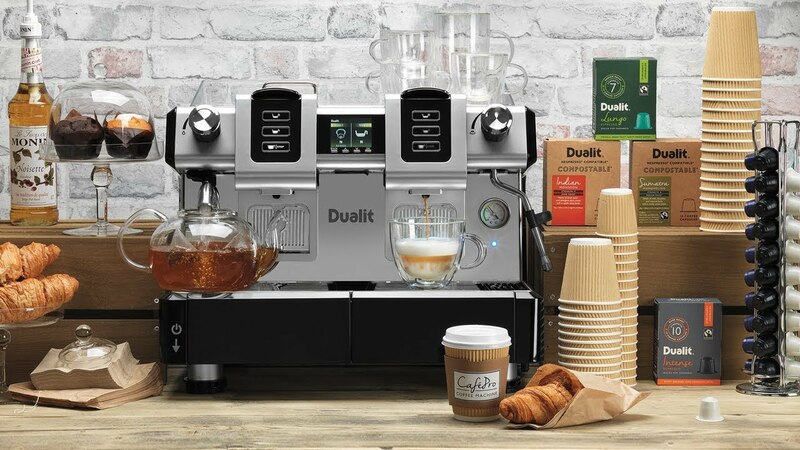 The Dualit CaféPro Capsule Machine offers a menu of coffee options that can be made quickly and conveniently. It provides an ideal solution for small cafés, boutiques, salons, work place canteens, pubs, B&Bs and smaller catering outlets that want to operate a professional coffee service but lack the requirement for a full coffee-shop style set-up. With a double brew head and professional, boiler operated steam function, the machine can extract espressos in seconds, whilst simultaneously frothing milk ready to prepare a range of hot drinks. The new CaféPro coffee capsule machine offers a convenient, fast and easy way to make café quality coffees and teas for your customers and staff. Each customer purchasing the CaféPro can claim a FREE variety pack of Dualit capsules by calling Dualit on 01293 652500. *Offer includes 6 x 10 capsules packs per purchase. Flavours may vary. The CaféPro is compatible with Dualit's NX® Coffee Capsules, Fine Tea Capsules and Nespresso®* coffee capsules. Dualit's award-winning, gourmet coffee capsules are mess-free, convenient and easy for staff to use without requiring training. With a double brewhead, the CaféPro can make two espressos or lungos whilst the individually controlled steam wand creates perfectly textured frothed milk, saving you and your customers valuable time. The CaféPro is a mains plugged unit and can be moved if required to free up space. The CaféPro is operated by a digital display with touch button menu options for ease of use.